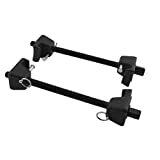 The Neiko 50605A Strut Spring Compressor is designed to compress most Macpherson spring sizes with a large contact and built-in pins to safely secure the locking mechanism into place. The heat-treated steel construction withstands tough operation while maintaining endurance. It features a forcing screw and safety latch for locking hook to spring. This is perfect for quickly replacing the strut cartridge or assembly repair. The OEMTOOLS Strut Spring Compressor is great for your shop or garage. This item is designed to compress most MacPherson Strut Spring sizes. The broad spring contact and built in detent pins help to lock the spring into place for safer spring compression. 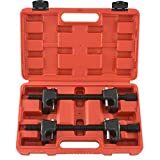 This OEMTOOLS Strut Spring Compressor quickly and safely compresses the spring for easy replacement of the strut cartridge or strut assembly repair. The hooks are forged and the center screw is hardened for long life. Note: Lubricate the threads of this tool with anti-seize compound to prolong the life of the center screw. 3 pairs of yellow covers help protect lacquered springs surface from damage. Blow mold case for storage. Removes the toughest strut spring for replacement quickly. Helps to repair strut components. Essential tool for car repairing. – DO NOT use brake fluid or any fluid other than hydraulic jack oil, which will cause serious damage and invalidate warranty. – KEEP CHILDREN AWAY FROM THE UNIT. Coil spring compressor should be securely fixed on the flat ground before use. Ensure yoke locating pins are properly positioned and safety clips are attached correctly. When applying compression to the spring, always stand beside the unit. When not in use, clean and store the spring compressor in a safe and dry place. Maintain the spring compressor in good condition. Use genuine parts only to replace or repair damaged parts. 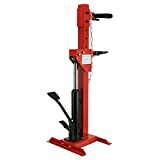 Wilmar W89311 Coil Spring Compressor for use on most automotive and light truck applications, with chrome moly steel jaws. Replacement parts available, bilingual instructions included. The OEMTOOLS Coil Spring Compressor is used to safely compress the coil spring on most vehicles and light trucks. It can also be used to aid in the installation of coil spring spacers. Comes in a sturdy blow-mold storage case. Always lubricate the threads of this tool with anti-seize compound to prolong the life of the center screw. This compressor fits most late-model rear wheel drive domestic vehicles in which the coil springs are between the upper and lower control arms. The tool features four case-hardened self-aligning plates to ensure correct load distribution under tension. Includes two 3-3/8″ ID plates and two 4″ ID plates. Will not work on Mercedes-Benz vehicles. Shankly’s heavy duty spring compressor for struts features rugged and durable frames, reducing bending and warping even under high tension. Shankly strut spring compressors bear an impressive 1000 kg maximum capacity per pair, making this coil spring compressor kit usable for most any vehicle make including large cars and trucks. Avoid a coil compression tool with unsecured and flimsy hooks which can cause slippage and safety concerns, Shankly’s strut coil spring compressor easy turning hex nuts grip springs securely and reduce safety concerns. This strut compressor features a wide jaw capacity (23mm – 280mm). Spring strut compressor work can be perilous if not performed with care. Shankly’s heavy duty spring compression tool includes lower security jaws and adjustable safety bars to better protect to worker. Shankly’s strut spring compressor tool is usable with 19 mm hex socket or wrench.